The marketing industry is always changing and evolving - making it pretty hard (even for us) to stay up-to-date on the lingo all the time. Here's a cheat sheet on words that are pretty important for anyone to know, whether you think you or your business needs marketing advice or not. Inbound marketing is focused on customers finding you through different sources and channels, rather than you seeking out to find them. Inbound is all about creating high-quality content that attracts customers, converts leads, closes and delights customers. With this process, you not only attract new customers, but you're keeping the ones you already have happy without any additional strategy. The chart below shows the benefits of using an inbound marketing methodology. Content marketing is the process of attracting and retaining happy customers through the curation of helpful, relevant content developed for a specific audience. This can be through blog posts, offers, webinars, ebooks, etc. This process should be ongoing and should be a consistent thing that your customers can count on, which is where having a strategy comes in handy. This will help you in developing, distributing and managing your content, so it aligns with your specific goals. Creating a content calendar is a big help with this. Social media marketing is the process of using Facebook, LinkedIn, Twitter and Instagram (and any other relevant social networks) as channels to increase your website traffic. The goal with social media marketing is to encourage followers to share your content on their own social channels. Lead nurturing is the part of the sales process where a company develops a relationship and directly communicates with the customer on a consistent basis until the customer makes a profitable action. Because today's consumers educate themselves about products and build trust with a brand before they make a purchase, this process is especially important to the success of small businesses. A workflow is a series of events which results in someone making a specific action on your website. For example, when someone downloads an offer or fills out a contact form on your website, you can set up a workflow that automatically sends that person emails or notifications to keep them interested and connected to your business. A buyer persona is a semi-fictional representation of your ideal customer based on your market research and actual data you've accumulated about your existing customers. Creating buyer personas is essential to determining how (and who) you want to attract and what sort of approach you want to take. 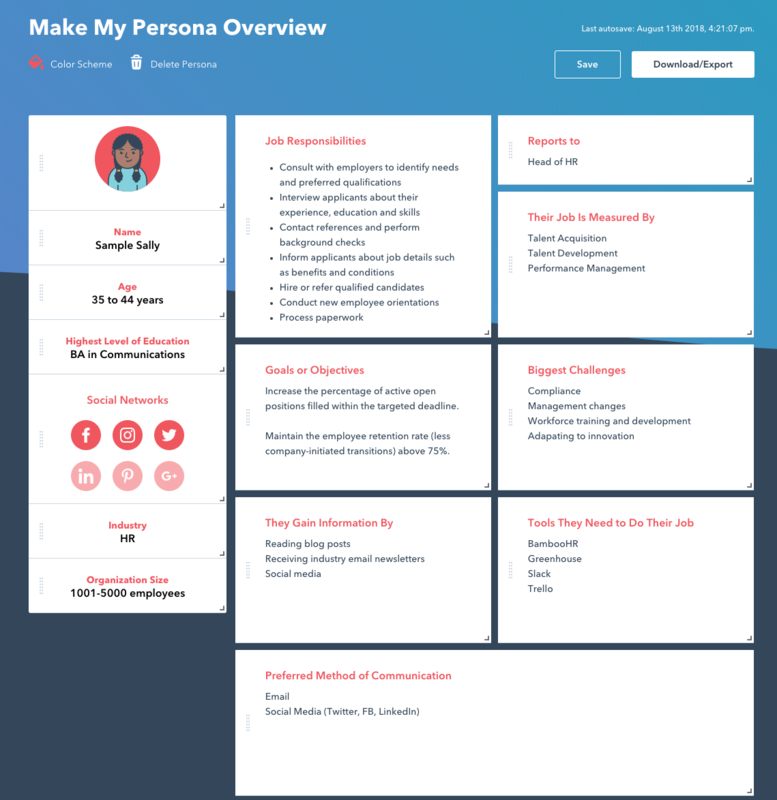 Hubspot has a tool which makes it super simple to create your personas. A responsive website is a website that has a design which is compatible for any screen format your customers might be viewing it on. For example, any given customer could be seeing your website from a large desktop computer, a medium-sized tablet or a small mobile device. Your website must have a responsive design in order to have an optimal viewing and interaction experience. A landing page is a separate web page (which has a different URL than your main website) which is designed to accomplish a specific objective - which is usually to convert a website visitor to a lead. These can be helpful if you have a special event or contest going on, so that the person can go directly to the page they are interested in. It's beneficial to have prompts asking for the customer's name, job title, company, location, email address, etc. on the page allowing you to connect with that person. Pay-per-click advertising allows your website to rank within the top few search engine results through paid ads, rather than earning clicks organically through content. With these ads, the business pays each time the ad is clicked. It's a quick way to get your website to the top of the page, without doing a whole lot of work. Search engine optimization is the process of improving a website's search engine ranking through unpaid results. SEO is a very tedious and detailed process which essentially details what your audience is searching for and what they want to learn about. Analytics are used to scientifically measure what's happening on your website - they can detail where your most valuable customers originally came from, whether your customers are reading your emails, and more. Analytics are graphs, reports and metrics that can be used to make improvements to your website and your user experience. A bounce rate is the percentage of people who visit your website, but leave before they get to the second page. Using your bounce rate percentage helps with determining whether your website has a good overall user experience. A conversion rate is the percentage of people who take a desired action or step, which is usually profitable. It essentially comes from the percentage of people who visit your website and become a customer. A meta description is a short text summary of what can be found on that specific webpage. For example, the meta description of this page is: "A list of topics related to marketing." Meta descriptions show up in search results underneath the webpage link. It's important to make sure your meta descriptions are concise, unique and don't contain the exact title of the webpage. Let us help you with your marketing strategy!